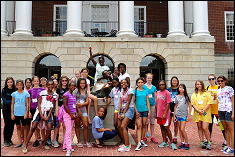 "Encouraging diversity and the inclusion of women is critical to the cybersecurity and STEM fields,"
Last week, the Maryland Cybersecurity Center (MC2) and the National CyberWatch Center K-12 Division hosted the CyberSTEM Summer Camp for 30 middle school girls interested in the cybersecurity field. The five day experience included hands-on activities designed to encourage young women to feel confident and excited about pursuing cybersecurity and Science Technology Engineering and Math (STEM) college and career opportunities. Attendees were eager to learn and apply basic concepts of programming, forensics, cryptography, and program management through a series of gaming, modeling, and simulation activities, which explored the interconnections of STEM fields. The camp featured a field trip to the National Security Agency Cryptologic Museum where attendees learned about codes, ciphers, secret writing, and the effect that cryptology has made on history. The young women later applied what they learned in order to decrypt secret messages. By the end of the camp, the attendees learned the fundamentals of computer programming and developed games using Microworlds software, which they presented during a closing ceremony for parents. The attendees’ enthusiasm for cybersecurity and STEM fields was noteworthy. "Encouraging diversity and the inclusion of women is critical to the cybersecurity and STEM fields," said Cristin Caparotta, Camp Coordinator and Graduate Assistant with the MC2. "It was great to see the depth of knowledge and the level of confidence that each of the attendees displayed at the closing ceremony and we hope that the young women’s curiosity and eagerness to study these fields will only grow stronger." The Maryland Cybersecurity Center is dedicated to introducing the cybersecurity field to students of all ages. More information on camps and workshops can be found here: www.cyber.umd.edu/education. For questions, please contact Cristin Caparotta at ccapa@umiacs.umd.edu.